The Groundlab team won the second prize in the ideas competition “Bellaria Hill Park and Antenna/Landmark for Salerno”, Italy. The competition focused on the landscaping and redesign of an area currently occupied by a series of telecommunications antennas. Partially owned by the Town of Salerno, the site is situated atop the Bellaria Hill and includes the entrance area, internal paths, parking and a belvedere in a public park. The objective was to recover the use of this panoramic park in the heart of the city and, simultaneously, to ensure maximum safety for residents and visitors through the environmental rehabilitation of the entire area and the realisation of a safe and functional Telecommunications Antenna. The design of the new Antenna must minimise visual and electromagnetic impact and constitute an expression of contemporary design able to represent an urban Landmark that substitutes the numerous, obsolete and disturbing antennas currently situated atop a series of unattractive and intrusive steel structures. The lecture will engage with the emerging concepts of landscape and territory as the milieu for the development of a territorial practice. This practice is concerned on the one hand with research on geomorphological formations of relevant landforms (Tectonic Grounds) and on the other with cultural, political and economic forces that drive and choreograph social formations of these landforms (Land Formations). The understanding of Land-Formations Tectonic-Grounds as a fundamental concept is not solely the concern of a geologist, sociologist geographers or any other related discipline, but of the Landscape Urbanist who sees them in turn as the core materials for a design practice that can allow the remergence and/or manufacture of future territories. In other words, Land-Formations Tectonic-Grounds are understood as cultural/spatial productions, derived from a constant and relentless human and natural activity full of conflicts, struggles, alterations, and shifts, within or outside legal or institutional frameworks, thus broadening traditional understanding of landscape and territory concepts as the result of specific historical processes with political consequences. 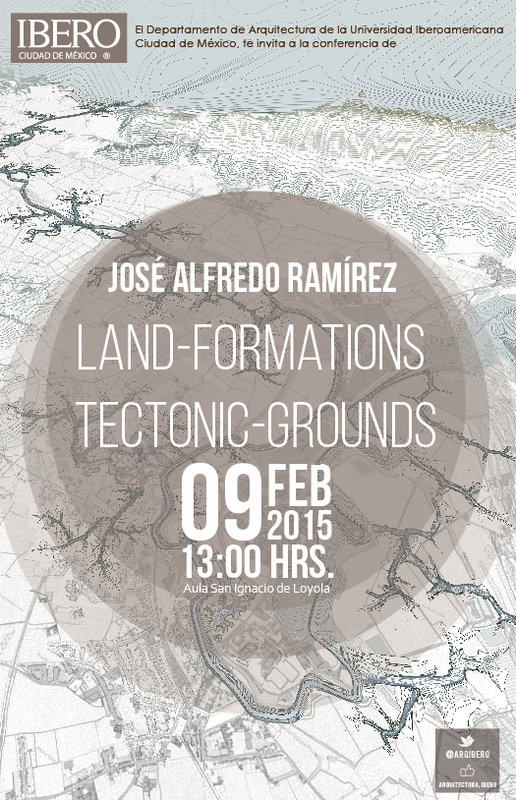 The lecture will address, through these lenses, the work of Groundlab, the AA Mexico City Visiting School and the Landscape Urbanism Programme at the Architectural Association.